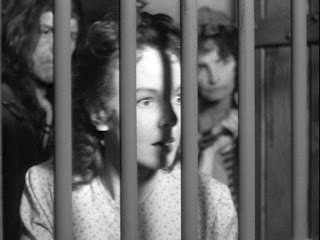 Val Lewton produced Bedlam (1946) shortly after The Body Snatcher (1945), and like that previous work, it is more of a grisly historical melodrama than a horror film. Also, like The Body Snatcher, there is no suggestion of the supernatural, as there often is in other Lewton-produced films. 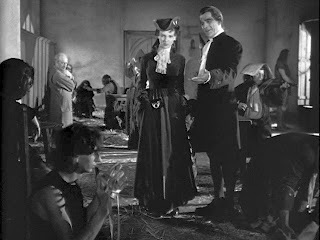 The screenplay, to which Lewton again contributed under the pseudonym of “Carlos Keith” and on which he collaborated with director Mark Robson, was inspired by Hogarth’s series of paintings, “A Rake’s Progress”, and there are several inset stills from that work inserted into the film for inter-scene punctuation. The film is set in 1761 at St. Mary's of Bethlehem Asylum, which is an allusion to Bethlem Royal Hospital in London and known as “Bedlam”. In those days citizens could amuse themselves by paying tuppence and entering the asylum to laugh at the lunatics that were held there. On one such occasion near the beginning of the film, wealthy Lord Mortimer and his protege, Nell Bowen, stop at the asylum for some entertainment and learn that one of the inmates has just died trying to escape. Ms. Bowen assumes upper-class airs and feigns indifference, but we soon learn that she suspects that the asylum inmates are ill-treated. Invited by the asylum master, George Sims, to inspect more thoroughly, Nell finds the conditions appalling and vows to campaign for asylum reform. 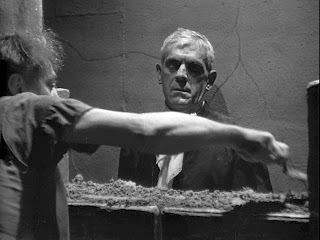 This sets the narrative conflict of the film, as the spirited Nell Bowen, played by Anna Lee, confronts the cynical and cruel asylum master, played by Boris Karloff. But the film is more than a simple melodrama, because it engages in a lengthy and nontrivial moral debate over the course of the drama. On the occasion of visiting the asylum, Nell runs into a morally upright Quaker, Hannay, who had just applied for a stonemason’s job at the asylum. They start a discussion about the proper attitude towards one’s fellow creatures that will run through the entire film. As a member of the Society of Friends, Hannay, of course, is steadfastly opposed to violence and believes that compassion and love (agape) are the only proper responses to whatever one encounters. Nell gradually becomes sympathetic but is sceptical that such naivete will lead anywhere. She does urge her patron, the rotund and foppish Lord Mortimer, to devote funds to the betterment of inmate conditions at the asylum, but Mortimer balks when he learns how expensive this will be. Nell becomes fed up with the self-indulgent Mortimer and scornfully abandons his patronage, returning to her former occupation as a street performer. But she contin ues her campaign against Mortimer and the asylum, and soon the devious Sims has her forcibly committed as an inmate/prisoner in the asylum. Now inside, Nell, is terrified by the possibility of being manhandled by the population of deranged inmates. Hannay manages to pay her a visit, but he tells her that he is powerless to do anything, and in fact now that she is “inside”, she has the opportunity to use Christian love to change the behaviour of the inmates for the better. This she does, and the inmates become docile and affectionate before her. When Sims comes around to impose his final “treatment” on Nell, the inmates turn on him and Nell escapes. Now in charge, the inmates put Sims before a mock trial. Sims pleads for his life, telling them of his own doubts and fears, and they surprisingly sympathise, but before Sims can make his escape, he is stabbed by a not-quite catatonic inmate. The inmates then use bricks and mortar to wall up the still-conscious Sims in “Cask of Amontillado” fashion, ensuring his death. Now, at the end of the film, news of the disappearance of Sims draws Hannay and Nell back to visit the asylum. When stonemason Hannay sees the recently cemented wall, he figures out what happened, but he clams up, signaling to us that Nell's pragmatic approach has apparently won out in their own personal contest concerning ethical behaviour. Nell whispers to him that, after all, the inmates have already suffered enough, and Hannay assenting, sighs in resignation that God will give final judgement, anyway. Despite generally good cinematography and acting, Bedlam has some weaknesses. The early upper-class frolics and witty verbal exchanges are supposed to be humorous, but they have a forced quality to them and don’t seem to lead anywhere dramatically. 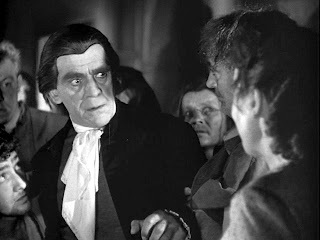 Anna Lee, as Nell Bowen, is excellent and magnetic, and Boris Karloff, in a strong performance as the evil George Sims, is unusually unctuous and serpentine, even for him. The strength of these two leads serves to carry the action and helps maintain the focus on the primary contest between them. The acting of the others is reasonably good, but as in Isle of the Dead, the performance of Jason Robards, Sr., is completely unconvincing. Overall, Bedlam is an odd mixture and perhaps tries to do too much. It is sometimes humourous, sometimes spooky, and sometimes alarming. It is expressionistic only at times, and it never quite hits its stride as a thriller, although it does have its moments. A praiseworthy feature is the fact that it reminds us of what dramatists and filmmakers have long sought to expose: the obscenity of psychiatric practice in Western societies and the unjust way that medical staff can incarcerate people indefinitely. Bedlam stands in a line with other excellent films, such as Shock Corridor (1963), and One Flew Over the Cuckoo’s Nest (1975), that have attempted, so far with very little success, to bring about an end to these practices . Outside of the main conflict between Nell Bowen and George Sims, the subtextual moral debate between Hannay and Nell has its own interest, particularly because of the conclusion it reaches. The film has not finally come down in favour of literal honesty or the strict observance of a code of social morality. Instead, it follows the course of the gradual opening-up of Nell Bowen’s heart and concludes on a promising note of love. Nell has followed her own unique path and has not submitted to anything or anyone -- not to the self-indulgence of Mortimer, not to the cynicism and force of Sims, and not even to the docility and helplessness of Hannay. It is the rigid Hannay, after all, who has changed at the end of the story, not Nell. She has succeeded on her own self-styled and passionate terms. For further reflections of mental health care, see my reviews of One Flew over the Cuckoo's Nest (1975) and Shutter Island (2010).